It’s 8:45 a.m. and you’re running down the Hoyt Street station stairs—the train is pulling up to the station. If you catch it, you just might be able to slide into the back row of your 9 a.m. without drawing too much attention to your bedhead and wrinkled clothes. You can make it—your roommate has wedged his body between the subway doors to keep them from closing. You finally swipe your card. The doors close and the train pulls away, taking your hopes of being on time with it. After walking a couple blocks to the nearest train station with a kiosk, you spend $121 for another month of dealing with the MTA. There are a lot of things in life that can’t be controlled; when you depend fully on the MTA, transportation is typically one of those things. The cheapest, fastest, and best mode of transportation, they would say, is biking. One of those bikers is Sophomore Pasha Goz, who started cycling around the city regularly in March of this year after purchasing a new bike at Atlantic Bicycles in Downtown Brooklyn. Thanks to his two-year warranty and King’s new housing location, Goz can now make the short five-minute walk from CityPoint for free repairs and then keep it in the free bike storage room at Albee. Goz bikes for a number of reasons, with speed and the experience being at the top of his list. As much as Goz enjoys riding up Broadway to Central Park or down the Westside Highway to Yonkers, New Jersey, one of his favorite things about cycling is the time he saves—particularly during his commute to work. 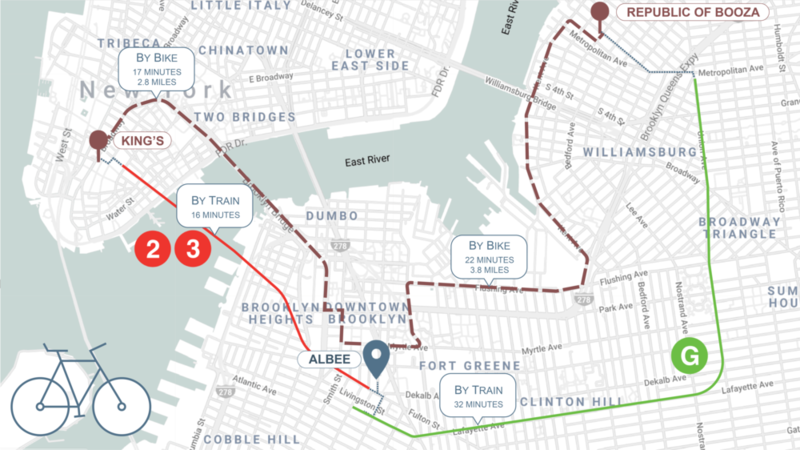 While it takes him nearly forty minutes by subway to get to Republic of Booza in Williamsburg, Goz cuts that time by more than half when he bikes. “Biking is actually the fastest way to get around the city most of the time,” Goz said. Among the few that cycle at King’s, the reviews are mixed on biking the Brooklyn Bridge to school. Whereas Goz never bikes to school due to the overcrowded tourist attraction, Sophomores Caleb Kent and Jonathon Keeler bike to school via the Brooklyn Bridge every day from their South Slope apartment. Despite being Brooklyn residents, neither buy monthly MetroCards thanks to their bikes. “I love it. I park my bike behind the school on a pole near the student union,” said Kent. “But I wish the school had a bike rack so bad, so that students’ bikes don’t get stolen. Meaning me and my roommates, who are the only ones who bike to school,” he said with laugh. Both Kent and Keeler strongly recommend biking to anyone who is looking to save money and have fun. But there are also drawbacks when it comes being a New York City cyclist that Goz, Kent, and Keeler can all agree on. For Keeler, the number one drawback is the ever-lingering possibility of theft. “The worst part about biking is worrying that your bike could get stolen,” said Keeler. Any part of the bike is up for grabs: “the wheel, the handle bars, the seat,” he remarked. Because of this, riding a bike means carrying around some extra weight. “It’s New York—you have to carry two locks. You’ve got to lock your bike, and then lock your front wheel to the bike,” Goz said. Senior Victoria Bevill has thought about buying a bike since moving out of the Financial District to Brooklyn for the first time this fall, but has decided against it for now. Other disadvantages, besides theft-anxiety and biking in business casual, include the possibility of bike accidents—something that Kent is familiar with. His advice to other bikers: “wear a helmet. It’s a good idea.” He also noted the added inconveniences of carrying a helmet and extra locks. Due to there being no bike rack at King’s, parking a bike can be a hassle. Despite these inconveniences, students who bike defend their chosen mode of transportation, agreeing they wouldn’t have it any other way. It’s rare to say the same for faithful users of the MTA. “[Biking is] fun, it’s a different experience of the city, and it’s faster than most other things,” Goz said. According to the New York Times, although they are still a small fraction of overall commuters, New York is now home to more bikers than any other American city. In Downtown Brooklyn, where 60% of King’s housing is now located, bikers now outnumber cars on Hoyt Street. Depending on what kind of bike you want, for around $300—“you could always go cheaper,” Goz said—you too could be one of those bikers, see more of New York in a whole new light, and save money while doing it. Or, you could just stick with the 4.3 million that prefer to do their traveling underground.